In the winter of 1922, sixteen men held a meeting for the purpose of organizing a community band. It was the beginning of the Shippensburg Band as we know it today. It was not the first band to be organized in Shippensburg. 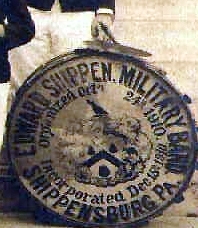 An 1871 reference has been found relating to the Shippensburg Concert Band which had successor bands known as the Walter Snodgrass Cornet Band and the Edward Shippen Military Band. Salvadore Collangelo, the band’s first director, organized the Shippensburg Band back in 1922. Shortly afterwards, Clarence Smith of Carlisle took over as director of the band and continued in that capacity until 1935. In addition to his duties as director, Mr. Smith instituted a beginning class of musicians in order to build the band’s membership. Professor Ralph Schecter, who taught English and Music at Dickinson College, served as director of the band from 1936 until 1961. He was followed by Kenneth Slater, a former cornet soloist with the United States Marine Band and the United States Army Field Band, who served as director from 1962 to 1966 when the director’s staff was handed over to Donald Bollinger. Mr. Bollinger served as the band director until his retirement in 1986, when he was followed by Victor Coble. Donald Bollinger returned as guest conductor for the fall concert in 1992, and as full-time conductor in 1993 until his second retirement in 2004. Our present director is Carl Sponenberg, former director of Big Spring High School.